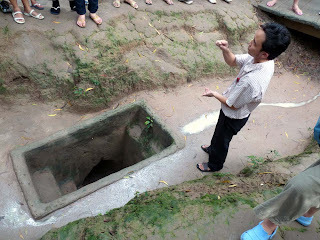 As a side trip just outside of Saigon, tourists can visit the Cu Chi tunnels which played a big part in how the North Vietnamese fought the war in South Vietnam. 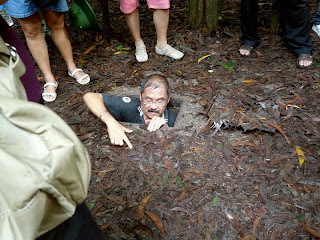 The Cu Chi tunnels are a very large network of tunnels covering 75 miles according to wikipedia, if you believe that website. The most impressive part about these tunnels is how small they were. 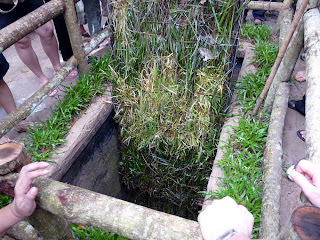 Despite their size, the Viet Cong were able to live in them for sometimes days at a time. Malaria was rampant. So were parasites, mosquitoes, spiders and scorpions. Along with the scorching heat and high humidity, it must have been like living in hell. To show you just how small they were, brave tourists can try and slip into one of the entrances. This guy couldn't get back out and had to be extracted with the help of two other tourists. Since most tourists can't fit in this small of an opening, the government expanded a section of the tunnels so that fat sweaty Westerners could enter them and experience the stifling claustrophobia for themselves. Here is the expanded opening. It still isn't all that big. This is me at the exit with a big cheesy and very inappropriate smile on my face. Why am I smiling? 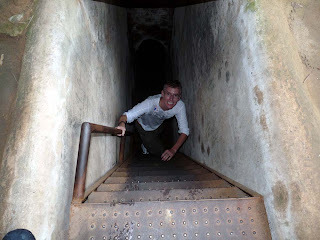 Because this photo is completely fake and I just couldn't bring myself to go down into the very cramped tunnels. Keep in mind that it was unbearably hot that day, the tunnels were very dark and I'm claustrophobic. I had to listen to everyone else who said that the experience was not very pleasant. As an added bonus, there were various exhibits around the grounds showing the deadly traps that the Viet Cong used to kill their enemies. This lovely little trap was meant to look like a patch of grass until someone stepped on it and plunged into a pit filled with sharpened spikes. Youch! 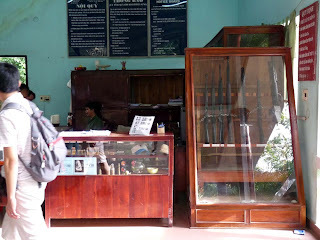 Just like an American theme park, there was a gift shop where you could buy souvenirs. 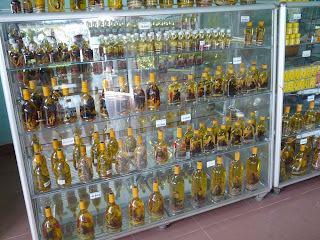 The hottest item was the Snake and Scorpion wine which is apparently good for rheumatism, lumbago and sweaty limbs! The wine came with either a snake or scorpion inside and I'm still not sure whether you're supposed to eat them when you drink the wine or whether you're supposed to put them aside. The bottles didn't come with instructions so I assume you just have to chug down everything. Thankfully, I don't have any of the above ailments so I don't have to worry about what is the preferred method of imbibing this strange beverage. If all this war stuff has got you turned on, then you can take your turn and fire off a few rounds. Here is the price list. It amounts to about a buck a bullet. 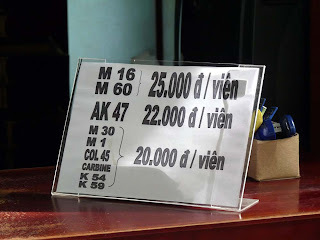 The fun you can have in Vietnam is truly endless.